Bitung, North Sulawesi, the gateway to Lembeh! If there was no diving around here, I would never have gone to Bitung. Bitung is the harbor town of North Sulawesi (previously Celebes) and the gateway to Lembeh. Most tourists that come to Bitung continue straight to Lembeh or their resort around the coast North of Sulawesi. We came here to extend our tourist visa and, of course, to SCUBA dive. This is all in the harbor area, East Bitung. We saw only one other foreigner in Bitung, driving like a local on a scooter asking us what we were doing. All the people looked at us, walked with us or said "Hello!" Really nice, but in the dark I was not too exited anymore. To extend your Tourist Visa On Arrival (VOA) for 30 days you can go to Manado and Bitung in North Sulawesi. Since we extended our visa many times in different countries we have better and faster experiences in smaller towns than big cities, so we went to Bitung. Our last extension in Bali took us three rounds, here we went in at 09:00 and we had to come back at 13:00 to check if the boss could fit our extension in his schedule - and it worked! One day service and the people were really friendly. It was more about helping out than showing off being the 'authority'. You do not need to dress up for a wedding, but dress up properly. Women are advised to cover their knees and shoulders. We went on our flip-flips, no problem. There is NO free WIFI here. You can find the latest information online, Kantor Imigrasi Kelas II Bitung. We brought a copy of our passport ID page, copy of the passport page with the Indonesian tourist VOA stamp and a print of our boarding pass to leave the country within the next 30 days. It still feels weird to buy a ticket before you know if the extension will work - but that is just the way things work here. Copy shops are easy to find. We found a computer shop selling printers to email and print our boarding passes. Inside the office you get papers to fill out and you need to hand write a letter (how cool!) to the officer asking for the extension. There are many local restaurants and karaoke bars in Bitung. The typical bright lighted, a little bit dirty, plastic chairs and boxes on the tables ones. Cheap and good! For dinner we fancied a bit more ambiance and preferably a Bintang beer with our meal. We found the Chinese Seafood restaurant RM. Haepawang and it was bright lighted and a bit dirty... If you like to cook something yourself or take away some beers, go to Citimart Swalayan next to Texas Chicken (fast food) - a big supermarket. Nasi Goreng at a local warung. There is something strange with North Sulawesi compared to other provinces in Indonesia to my concern. Hotels are either horrible expensive for mid-range quality - you can find these online or they are mid-range priced for low quality without the possibility to book online. The (dive) resorts are quite remote located and mainly offer full-board. It is quite hard to find something below 35 euro per person per night, excluding diving, transfers, national park fees, local taxes, etc. 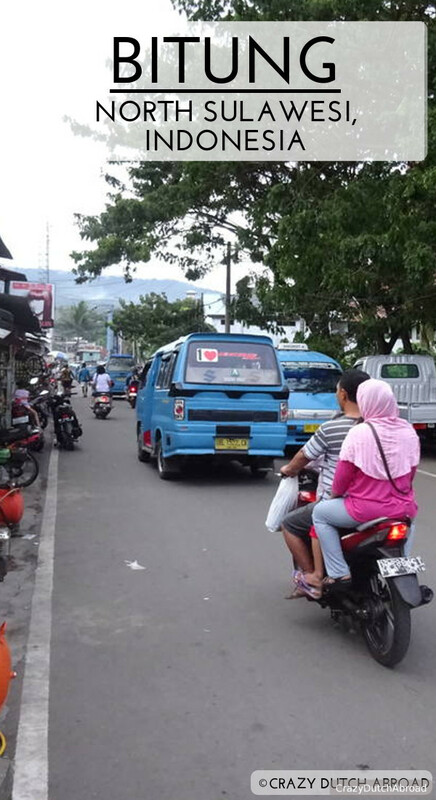 Since we were not in a hurry we decided to take a taxi from Manado and look around for a place to stay in Bitung near the immigration office. Most of the 'cheaper' hotels looked really old and dirty from the outside, like a scene from a horror movie, no western standards. We ended up in Dynasty Hotel / Mandarin Hotel for 220.000 Rupiah per night with air-conditioning. The room was really dirty. Mandarin / Dynasty Hotel Bitung. Some people offered scooter transportation but I do not know if this is a good idea. We walked around town. To get to Lembeh you have to go to the harbor, there are several. At the end of Jalan Samuel Languju many small boats were loading and unloading, this is were we jumped on the boat to Lembeh. The other harbors are for the big boats and container ships. Visit my other blog for information about diving in Lembeh Strait. Click here for SCUBA diving in Lembeh Strait!